Destroy and prevent unsightly algae growth in your swimming pool. Whether you want to treat your water weekly or if you are looking for a longer term proven solution you will find it here. Remove unwanted phosphate from your swimming pool water. 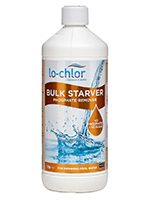 Phosphate is the essential ingredient for algae growth so remember NO PHOSPHATE = NO ALGAE. Ensure that your swimming pool water remains crystal clear with our extensive range of products. Our technologies provide the perfect solutions whether you want a natural solution or more traditional chemistry. Unwanted metal stains or calcium scale? We provide a proven range of both curative and preventative products that provide the right solution to your problems. A specialist range of products that cure a multitude of issues from cleaning filter media or salt cell electrodes, lubrication to prolong the life of seals to fixing of minor leaks in pipework.